We will be offering prizes in line with Wessex League recommendations. 1-2-3 podium presentations will take place as soon as possible after each race. Nice video of the day! U12s, U10s - please enter online too! A full programme of races for all ages. Course is mainly on lawns and rough grassland, with some hard gravel path and a few berms to negotiate. 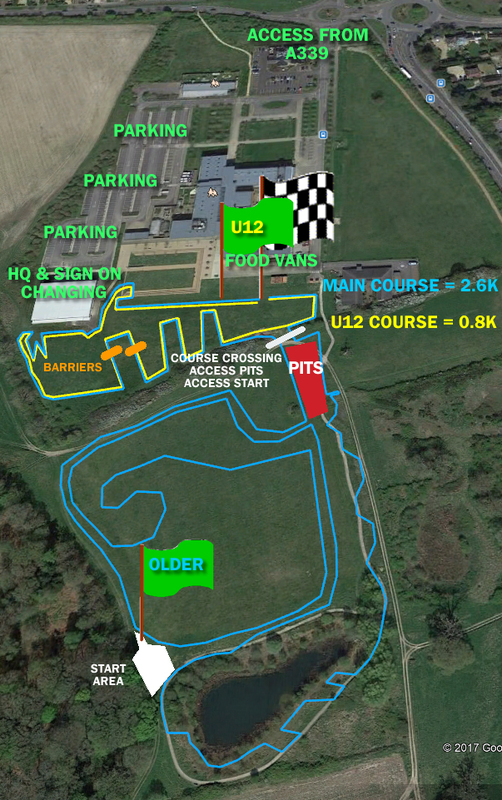 Click the plan to see a rough idea of the course and layout of access, HQ etc. On the day adjustments possible! Course runs clockwise. The course is on the grounds of Newbury College, Monks Lane, Newbury, Berkshire, RG14 7TD. Please park in designated parking only, under direction from parking stewards. Car parking at drivers’ own risk; Newbury College and the race organisers will not accept any liability for any accidents, damage or loss incurred. !PLEASE Pre-register for Wessex League! For the 2017/18 season the Wessex League is asking all regular riders to pre-register their details. Registered riders will have a season-long race number. It is free and voluntary, and the league committee would like all riders who think they will ride 3 or more league events this season to pre-register for the league. Pre-registration is NOT the same as race entry! It is NOT a requirement for race entry! Burger van and coffee van - oh yes! Newbury College is private property - please respect the privacy of the students and staff and keep to the areas open to the race. The programme is a joint endeavour between Newbury Road Club & Palmer Park Velo, held on the grounds of Newbury College. We are grateful to the College for welcoming us. Palmer Park Velo is a racing cycling club for children aged from 8 to 18. We are based in Reading’s outdoor velodrome at Palmer Park Stadium. © 2016 C C Elsey. All Rights Reserved.